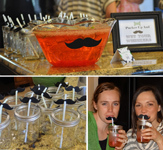 Want some great baby shower punch recipes? Whether you are looking for a blue or pink punch to match the baby shower theme or you are looking for something yummy that everyone will enjoy, we've got you covered. 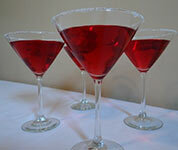 All of the punch recipes listed on our page are delicious and easy to make. When looking for a punch recipe, consider the types of ingredients involved and how the flavors will go with the rest of your meal. Do not be afraid to experiment and come up with your own final concoction. 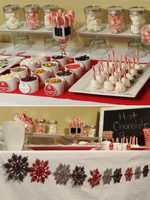 Creating a beautiful blend of flavors can be the highlight of your baby shower hosting experience. 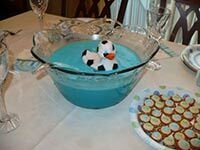 Baby shower punch is usually a mixture of a base punch or juice mixed with some kind of sherbet and soda. Sometimes it is also mixed with frozen fruits or fresh sliced fruits to give the taste a twist. 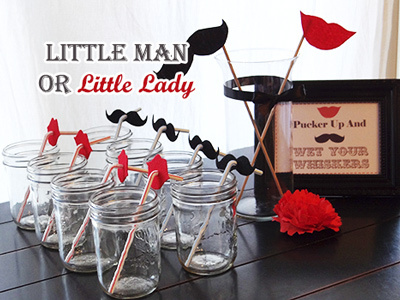 Here are some of the ingredients that are common to the punches seen at baby showers. You can mix and match ingredients to make your own kind of punch. For ice you can freeze the base juice in ice trays. This way you can keep the punch cold and it will not be diluted. In a pitcher, pour half of the bottle of Simply Lemonade and half the bottle of sprite. Add lemons and limes for garish. Enjoy! Refill pitcher with equal quantities of lemonade and sprite as needed. This recipe is delicious; your guests will never know it is low calorie! In a 5 gallon jug, combine 2 packages each of strawberry, lemonade, and orange Kool-Aid. Add 1 container of Pina Colada mixer and 1 46 oz. can of pineapple juice. Add 2- 2 liters of Sprite (or any lemon-lime soda). Add ice and serve. One mixture makes a little less than 3 quarts. Split it in half and serve 1 1/2 quarts of punch with 1 2 liter bottle of Sprite. Then refill as needed. Boil water and sugar together and stir. Add pineapple, lemonade, orange juice and banana. Pour in a container and freeze. Chop in a punch bowl. Pour 7-up over frozen mixture. 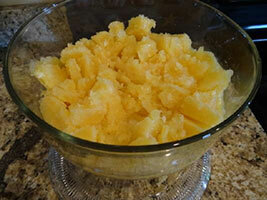 (If you have a masher like a potato masher on hand, it makes it a lot easier to mix the punch). 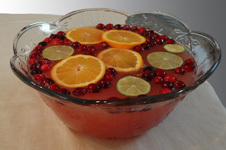 Pour CranRaspberry juice and sprite together in punch bowl or large pitcher. Add package of frozen raspberries. The raspberries serve as ice cubes without diluting the drink. In this picture I rubbed corn syrup along the edges of the glasses and dipped them in sugar. It looks great and makes the drink even yummier! Note- to make a larger batch; use 3 cups of sprite for every 2 cups of CranRaspberry. Chill fruit juice and 7 up. Simmer water, sugar, and cinnamon for 10 minutes. Set aside for several hours. Before serving, remove cinnamon sticks from syrup. Combine all ingredients. Garnish with lime, lemon or orange slices and cranberries. Mix lemonade, orange juice, water, ice cream, sherbet. Serve immediately. Serves 50. Mix pineapple juice with lemonade, raspberries, and CranRaspberry juice. Freeze for about 24 hrs. Serve with Sprite or 7-up. I split mine punch into 2 gallon freezer bags. I used one frozen package of raspberries per freezer bag. That way, it is easy to make smaller portions and refill the punch as needed. Heat sugar and water in a large pan. Let cool. Add mashed bananas, orange juice, lemon juice, and pineapple juice. Stir and place in freezer. Remove from freezer when ready to serve. Allow to thaw a little. Place in cups and add 7-up to the cups. Dissolve sugar in hot water in a large pan. Add lemonade. Freeze mixture. Add sprite to drink. Place all ingredients into blender. Blend until frothy. Serve in punch bowl with additional vanilla ice cream scoops on top. I found that the 1/2 cup of sugar was the perfect blend of tart and sweet to mimic the orangesicle. For less tart, use less mandarin oranges, add more sugar to make the flavor a little sweeter and more ice cream scoops for a stronger vanilla creme flavor. Add to a large punch bowl. Make 20 to 30 minute prior to serving to allow the sherbet to melt properly. If you like foamy punch, try not to stir the punch too much. If foamy punch is not liked, then stir away! Mix together. Serve immediately. To make ice ring, pour just enough water in a salad mold to cover the bottom. Arrange thin lemon and lime slices with mint sprig in between. Stand the sprigs so that the stems are up. Slowly pour more water in mold. Carefully set in freezer and let stand until frozen solid. 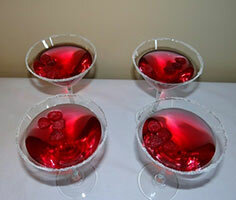 Use leftover maraschino cherries as garnish. Mix all together prior to serving. In large punch bowl, mix Kool Aid, sugar and water. Add Bacardi mixers. Stir until well blended. Add 7-up just before serving. Add 1-gallon Vanilla ice cream to the above Blue Punch. Add Your Favorite Punch Recipe!